Police officers stand near a cordon at Manchester Victoria Station, in Manchester on January 1, 2019, following a stabbing on December 31, 2018. Police say that the sole suspect in the stabbing of three people in the English city of Manchester on New Year's Eve has been detained under the Mental Health Act. Greater Manchester Police said in a statement late Tuesday night that the 25-year-old man arrested at the scene was assessed by medical staff before the decision was reached. Police are treating as the attack as a terrorist incident. They say the investigation is ongoing, and do not believe others are involved in the attack. Officials say that verifying that the suspect acted alone without a support network is a key objective of the investigation, headed by counterterrorism police. Police are searching the suspect's home in Manchester for evidence. The suspect has not been identified. 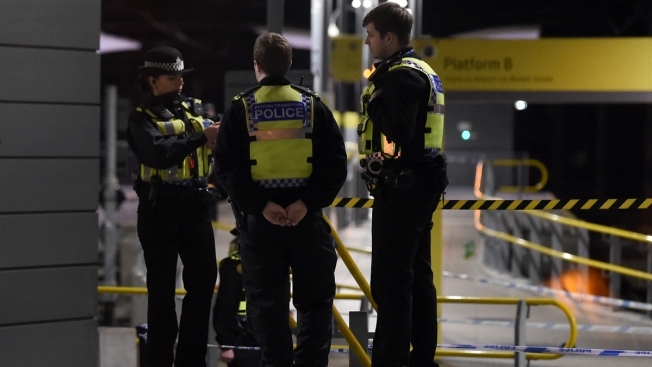 He is accused of stabbing three people including a British Transport police sergeant at a Manchester rail station Monday night while shouting Islamic extremist slogans. Two of the victims — a man and a woman who were on the rail platform when the attack began — are still hospitalized with serious injuries that are not judged to be life threatening. A police sergeant who was stabbed in the shoulder when he came to their aid has been released from the hospital. The attack took place on New Year's Eve at Manchester's Victoria Station, which is next to the Manchester Arena, the site of a May 2017 suicide bombing that killed 22 people at a pop concert. Britain's official threat level has long been set at "severe," indicating that intelligence analysts believe an attack is highly likely.